One of the largest monsters, its body is composed of exceptionally dense cells making it very heavy. 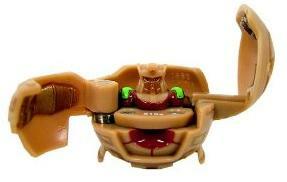 When battling it uses its massive fist and a shield decreasing the G power of any Bakugan. Normally gentle and obedient, only Julie can calm it down when angry. Gorem evolved into Hammer Gorem in the middle of a battle with Clayf, one of the Legendary Soldiers of Vestroia. He has a hammer and is strangely a smidgen inverted colors, as well as now having bull-like horns and upward curved shoulders. He also gets a considerable power increase. Purchase Gorem from Amazon now!